SH 121 Southwest Parkway Section 2C | Texas Shafts, Inc.
Southwest Parkway is a $1.3 billion dollar proposed 8.7 mile, six-lane tollway that will extend from the City of Fort Worth’s Central Business District at IH 30 to southwest Fort Worth. 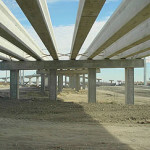 The North Texas Tollway Authority (NTTA), the Texas Department of Transportation (TxDOT) and the City of Fort Worth, in conjunction with a Citizens Advisory Group have cooperatively developed a Corridor Master Plan to guide the design development of the corridor with respect to aesthetic features. Our portion of this project included working with Union Pacific Railroad in and around their Davidson Yard. 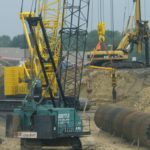 We will install over 1,000 drilled shafts of all sizes from 18” to 96” in diameter, approximately 32,000 total linear feet. Southwest Parkway is a $1.3 billion dollar proposed 8.7 mile, six-lane tollway that extends from the City of Fort Worth’s Central Business District at IH 30 to southwest Fort Worth. We installed over 1,000 drilled shafts of all sizes.